EDIT (2016): Back in 2011/ 2012 when I originally began Creating the sets of posts and the Countdown to the Prissy Princess Poodle Palace Comic I had every intention of creating the Comic, the Script was already Written, Half the Pages were already planned out, I had started Pencilling and Inking Proper Pages and I even have at least half a dozen additional pages of documentation laying-out the first ideas and Story-line of an Additional Scenario Introducing the 'Whole Town' (The Prissy Princess Poodle Palace salon is located in the Very Middle of that Town) full of Alpha Men & Women and the story's of their little Beta Partner Bimbo's, Sissies & Pets. I don't know if any of these Stories will ever come to fruition, I sincerely hope they all do someday, but I just wanted to clarify the Prissy Princess Poodle Palace Comic Situation. Always a Bride *SNAP* Never a Man! You mention that you wish you'd left one of the chubbier sissies in the display windows but I thought the sissy second from the left on the top floor had a bit of a belly anyway. I like that. ^_^ I think chubbier sissies look more "real" and I prefer it to ultra-feminine sissies. I wish more artists would draw sissy boys showing off their curves. =P We have BBWs, we could have BBSissies! Are you sure this is not a feminized scene from Dusk Till Dawn? love to see the progress, I always look forward to something new at your blog. I like the little cutie in the window lower right with the bouffant flip and bow hairstyle, also the darling trussed up and sitting and waiting in the convertible. Just had a thought, is there a binding station or a securing area where the sissies are bound before leaving, or is that done at the styling station by their hairdresser after there coif is complete? Sure would like to see some nice pouffy angled bobbed hairstyles as well as some tight straight skirts on a few of the pretty little bois. Thanks for keeping all this going. I was wondering if you had plans to revisit your Amsterdamned Nites I liked the story line and was hoping to see more. but you seem pretty busy as of late. I must admit I'm to really into the sissy thing but your art style is something else. The girls look so amazing. This was one I remember seeing a picture for (I think) of a pink poodle in her kennel? I soooooo wanted that comic to come to life!! I think you may be thinking of 'The Strapford Pound'. You can't hold the PPPP salon hostage any longer. Please give us possibly a few sneak peeks of it's progress? Truth be told this image was the last piece of work I created on the PPPP Salon, Other projects, more precisely Financial Needs rose their heads at the time and I had to divert my attention away and work on paying projects instead. At Some point I would very much like to resume work on the Prissy Princess Poodle Palace, BUT I like to only work on one project at a time and at the moment its the Strapford Pound, after the Strapford Pound is a project which has already been drawn out in its entirety and then after that... Who knows!? Sorry I can't give you a 100% confirmed answer, I truly don't know how the future will unfold. 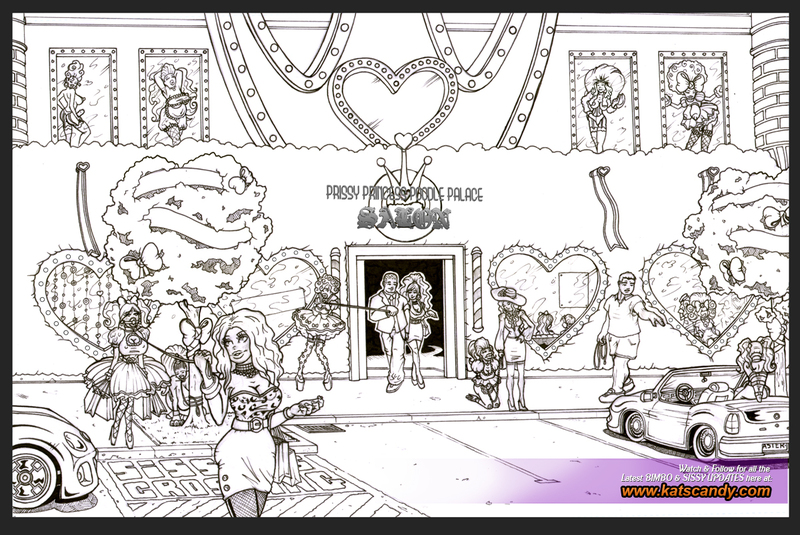 What I can say that is that while it has been 5 years (WOW :-O) since I last worked on the Prissy Princess Poodle Palace, I have not forgotten it. thanks for your comments and I will be patiently waiting for the PPPP continuation. Teased and tied at the Pink and fluffy PPPP. NEW LUSTOMIC COMIC - NEVER CROSS A REDNECK is OUT NOW! THE STRAPFORD POUND PAGE 10 (PART 3 of 3) - The Catalogue! SISSY PIN-UP: PRISSY SISSY MADE A MESSY!! !